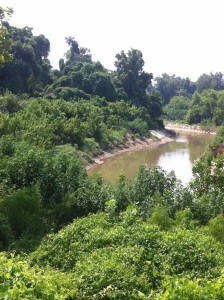 Native box elder and other riparian vegetation naturally restoring a sandy bench, trapping sediment, and creating riparian buffer on the south bank of Buffalo Bayou. This area, belonging to the River Oaks Country Club, will be excavated and the bayou channelized and moved. Photo taken July 2014 from the bank of the club golf course. The riparian vegetation in the foreground has since been killed, apparently in the process of preparing the golf course for reconstruction. Steve Hupp, water quality director for the BPA, represented the BPA/flood control district point of view, which is sadly supported by the Memorial Park Conservancy. You couldn’t see it, but the flames from Mr. Hupps’ pants were filling up the broadcast room with smoke. We can and should tear down the natural forest that’s been growing there for at least ninety years and longer, dig up the ancient sandstone and rebuild the banks that were previously held together by the massive root systems of everything we are bulldozing, and plant a new, better forest. The existing forest is healthy and healing, despite having to adjust to urban runoff and high water flows from development upstream. We are not going to do anything about urban runoff or high water flows, but miraculously our new baby trees planted up on our artificially engineered banks won’t be affected by runoff and high water like the old forest was. Our new, engineered forest will be better than nature! Steve Hupp is standing on an eroded cliff with a 20-foot drop to the water below. But these magnificent cliffs have little changed in at least fifty years. They are thousands of years old, part of what is known as the Meander Belt Ridges, and they exist on all the west-east flowing streams in the Houston area. The areas where there has been the least change in the bayou channel are the areas where the banks are the steepest. This is a flat out lie. If the banks were eroding by one foot per year, the banks on both sides would have lost thirty feet each in the last thirty years. Aerial photos and topographic maps show that this is clearly not the case. But let the Harris County Flood Control District refute Mr. Hupp. The district says that the annual erosion rate in the project area ranges from zero in about a third of the area surveyed to a max of 3.36 inches in one tiny segment. And please note that more than half of the project area is private land, some of which has been managed in a way to cause erosion from the tops of the banks. The best way to fix that is to change damaging land use practices, like mowing up to the edge, killing off riparian vegetation and driving golf carts on the tops of the banks. The documented erosion rate ranged from 0.00 feet per year in 11 of the 32 segments (accounting for 27% of the surveyed area) to 0.28 feet per year in one segment, which constituted less than 5% of the surveyed area. Averaged over the entire survey area, the mean annual bank retreat is 0.035 feet. We could recast that as 0.42 inches or 11 mm. According to the survey, it would take more than 28 years for the average slope to retreat 1 foot. Even on the one little bit that is eroding the fastest, it would take over 3.5 years. Of course, Nature only works in fits and starts. It is entirely possible that 1 foot goes away in one storm, but that event is then usually followed by a long period of quiescence. My own observation suggests that even if the top of the bank retreats 1 foot, that dirt doesn’t actually move very far. It probably crumbles and slides down through the high water, and winds up not far downslope and not far downstream from where it started. Please consider donating to Save Buffalo Bayou so that we can continue to fight this battle, which will likely include a legal challenge to the construction permit currently being considered by the Army Corps of Engineers. The Texas Commission on Environmental Quality must also certify the permit. And the Houston City Council must decide whether this taking of public parkland for a “demonstration” erosion control project is a proper use. We have lived on the Bayou since 2006 along the reach of the proposed project. In the first 12 months we saw our tall banks erode back by some 50 feet into our property. We spent a lot of money with a well-known evironmental engineer, using concrete rip-rap instead of toewood at the base, and step planted the slopes. Within a few years, the greenery was better than it was before and we have suffered no more erosion. We have seen the tall banks on the River Oaks golf course continuously erode, with many large trees falling into the Bayou. The banks erodes at their base in a flood, the water recedes, and the overhanging bank and vegetation collapses. The process then begins again. From the practical experience of living on the Bayou, I can assure you that these silty banks will erode very rapidly and the riparian forest does not prevent this erosion, especially so on bends in the Bayou. Ray and Terri Thomas are property owners on Rains Ways whose property will be “restored” at taxpayer expense by this destruction project. Terri Thomas was instrumental in creating the project, and Terri Thomas was a board member of the Memorial Park Conservancy when she voted in favor of it. Why Terri and Ray think they need their land “restored” at all is a mystery, as it is healthy and doing fine since they paid to have it restored some years ago, just as Ray describes. They have no erosion problem now, says Mr. Thomas. We floated past the Thomas property Friday, Oct. 24, 2014, and it looked lovely to us. Please note that the Thomas property and other large properties along Rains Way had erosion problems years ago because the developer, Jack Rains, stripped most of the riparian forest from the land before he sold it to people like the Thomas’s in 2006. These are the problems that Ray Thomas refers to when he talks about trees and banks washing out twelve months later. And that’s the main reason why this project to destroy riparian buffer on Buffalo Bayou is so wrong. It demonstrates to landowners on the bayou exactly the wrong thing to do to protect their property from erosion.